Hi everyone, here I am, late again. However, I've been reading lately quite a few angst-ridden posts where the bloggers are struggling either with keeping up with the posting, or with content, or with the perceived originality of their work portrayed within. I've come to the conclusion that if you blog when you feel like blogging, about what ever you wish to write about, and you conduct yourself with integrity on the 'originality' front, then you can't go far wrong, and in the process give yourself a lot less anxiety over what is supposed to be a pleasurable activity! There, homily over! Well, lots of photos for you, all about last week's activity. So let's get going. I wanted them for Tuesday's supper, as my friend Sue K. was coming to stay and had positively DEMANDED wild garlic dolmas. I made so much steamed bulghur wheat (instead of rice, as in the original recipe) that I made a 'shape' as well in a pudding bowl. And very nice they were too, full marks from Sue. I made smoked haddock fish cakes too - which, thinking about it, made a a meal a bit heavy on the carbs. But it was good, and I made some some homemade roast tomato sauce to go with it. Yummy! And to your relief, this is probably the last Wild Garlic post of the year! The really exciting event of last week, and the reason for Sue's visit, was the lino print workshop at Grey Friars' Art Space, on Tuesday. 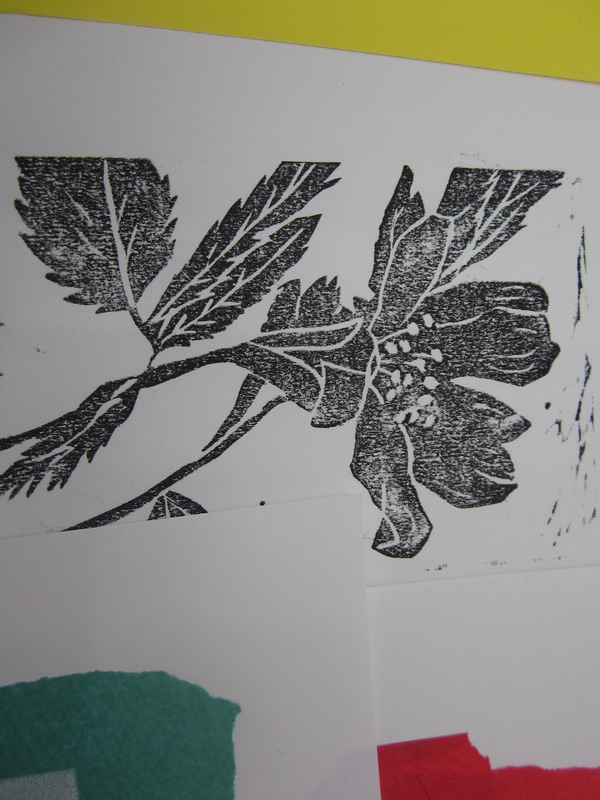 Lovely Amanda Colville of Mangle Prints was giving the first workshop of the year and we were thrilled to get places as Amanda wanted to keep the classes small. It was a lovely day, Amanda's calm competence made for a relaxed atmosphere, despite the fact that we were working quite intensively and learning new skills as we went. We had all taken some design ideas, and after Amanda demonstrated the process we got down to transferring our designs to the lino blocks. A lovely example of Amanda's prints. If you're not familiar with her work, check out her website and Facebook. I have blogged about Mangle Prints earlier - last Autumn if I remember, you can read about it if you check my archive. Here are some shots of our carved lino blocks. I learned some valuable lessons that day - not to be too ambitious and make a too-detailed block for my first attempt being the most important one! I had carved a rubber stamp fish image some years ago, and thought I might utilise it for my print. It was a good idea, but I made it too fussy with seaweed back-ground, and too many lino 'streaks' to indicate water movement. But it was a good learning curve. Sue's design taken from a pattern book, of fruits in cross -section. I loved this design so I pinched the idea for my practice piece, below. I didn't finish the carving on the day, but used it to experiment with some tissue paper later, as I felt my fishy design was too fussy, with too much detail. I'd made this fish carving a few years ago when I was carving rubber stamps. I printed it onto the lino block and traced the middle one to reverse it. Too much sea-weed and 'waves' took me a long time to carve so missed out on some experimenting time. But it taught me a valuable lesson about content. This is Lizzy's design; I'm sorry Lizzy I didn't get a photo of your other plate for some reason. Kathy's sunflower and tea-pot, a beautiful plate which took on an almost oriental feel when she printed onto red tissue. And this is the lovely floral plate which another Sue produced. Here are some of the finished prints - you can marry them up with the lino blocks above. This little fellow is SueK's practice piece - I love him! And here you can see some of the finished prints. I don't seem to have one of yours, Lizzy I'm so sorry. Come on, Amanda, when is YOUR book coming out???? Well I spent most of Sunday carving; first I tidied up my fishes block, and am much happier with it now with the extraneous carving marks removed. Then I stamped and free-hand drew a plate with one fish, a border, and some words. This is going to be a card for Jim, but I'll show you more when I have printed the plate. Such fun! TOTALLY addictive. And I developed arthritis in my right forefinger overnight, with guiding the gouge through the lino. I'm sure I will learn to relax more as I go along. So a HUGE thank you to Amanda for a super workshop, and for introducing me to this wonderful craft. Now I just have to learn to draw so I can make original designs. A quiet retirement? I think not! PS I'm afraid Blogger's imp of mischief crept in here and cut off my post half way through, so I have had to try and remember what I originaly wrote and do it all over again. Such a pain. But I hope I have remembered enough to convey the delight and enthusiasm this day produced in me. Glad you enjoyed yourself. I remember doing this when I did my access and HE course at college. My hands used to ache like hell. I preferred to print onto fabric stiffener I think it is called. The kind you iron on (or not if needs be) for collars, cuffs and pelmets. Various thickness's can be obtained from The Fent Shop.It comes in white and black but the white enables you to colour it before printing. Then if careful, using the iron and baking parchment (no steam), you can attach it to card or other backgrounds. Simples! Ah, Pelmet Vilene, Pelmet Vilene, how I do love thee! Hi Dc , I could probably have shares in the Fent Shop - especially on the pelmet vilene front! I discovered it when going through my 'experimental' stage with textiles. But I have never stamped or printed on it before - what a good idea, thank you! The number of people who've told me that they 'did' lino cut printing at school or college - I was never so lucky; but now is my time!! What a fabulous workshop, when I was in the WI I loved doing different workshops, sometimes I amazed myself and others not a chance! Like a few of your followers I did Lino printing at junior school and I remember it being hard work. Excellent advice on blogging and such delicious food, those Dolmades look amazing, you have certainly made the most of the free wild garlic. Hi Karen, thanks for you comment. How on earth did I reduce Dolmades to Dolmas? Is there such a word?? Anyway, you knew what I meant! I did lino printing at school too as part of my 'O' level course. Absolutely loved it apart from the aching cutting hand! I'd love to try it again. I may even drag out my art folder with my school course work in it! We haven't managed to find the time to forage any wild garlic yet this year - I usually make a huge batch of garlic butter and freeze lumps of it. Hi Vintage Jane, well you are yet another one who did this at school - and remembers the aching hand! If you do start again you will be hooked!